Argentina has been recently in the world media. Again, because of a crisis. The Argentinian Peso is one of worst performing currencies in the world. And in the last couple of months, it devaluated approximately 50% against the US Dollar. However, this economic setback is definitely not the whole story about what is going on in the South American country. Paraphrasing Dickens, we can say that it is the best of times, it is the worst of times. So, what are the reasons to be optimistic about my country? An analysis of the last decade of elections shows that support for peronism is declining. And a majority of people is ready to vote for an alternative to peronism provided that they seem reasonable and with certain capacity for political maneuver. It is very interesting what is happening not only at the national level but particularly at the level of the Province of Buenos Aires. After so many years of populist mismanagement, the economic decadence — and frustration — is palpable. The defeated presidential candidate Daniel Scioli ran a campaign in 2015 promising to build sewers for the population. Yet Mr. Scioli himself was governor of Buenos Aires for eight years and his party was in office in that province between 1987 and 2015. Twenty-eight years, apparently, were not enough for Peronism to solve the sewage situation. At La Matanza, for example, almost 40% of its 2.2 million inhabitants are poor, there are 114 villages and half of the streets are dirt roads. In fact, 50% of the marginality of the country is concentrated in Greater Buenos Aires. After 70 years of political predominance, the decadence caused by Peronism is palpable and is visible to all. It is seen in the dirt streets, the miserable living conditions of millions of children, the explosion of slums, the aberrant marginality of the suburbs, the feudalization of the northern provinces, the fall in the levels of life and wealth -and not only against the most developed countries but against our neighbors in the region, technological backwardness, rampant corruption. The list could be almost endless. The once mighty Peronist party is today reduced to a feeble league of northern feudal lords and the most pauperised suburban belt of the province of Buenos Aires. It may be that the excesses of former president Cristina Kirchner marked the pinnacle of the Peronist power and the start of its decline. The current president, Mauricio Macri, went to elections offering a clear anti-populist alternative. He won in an election that was as surprising and shocking as Brexit and Trump. He did very well in all sectors of society, including the worse-off. The surprise that Macri’s election provoked among pundits, pollsters, and even the business community could (and should) be attributed to underlying tendencies within Argentine society. These tendencies are not yet fully appreciated. It could be the case that Macri’s victory is a symptom of something much deeper. Namely, that Argentinians have had enough of populism. I am a Board Member of Red por la Libertad (Liberty Network). It is an umbrella organizations which gathers think tanks, foundations, student groups etc. that promote Classical Liberalism in Argentina. We have identified more than 50 (in different stages of development, of course). But 50! It’s a very good number and show how vital the Liberty Movement is in the country. There’s also nationwide effort to create a Libertarian Party in Argentina. What’s more, they are currently having talks with very high profile people to have a very strong presidential candidate in 2019. Attendance to liberal and libertarian events is increasing. In August Fundación Internacional Bases organized the 7th edition of the International Conference “The Austrian School of Economics in the 21st Century.” Hundreds of people participated – most of them very young. In this regard, student groups like Estudiantes por la Libertad – Argentina are carrying out a magnificent work in empowering and introducing the new generations to Liberty. Moreover, Argentina has great quality and quantity of Liberal Public Intellectuals. By this I mean individuals who are regularly consulted by the media, who write op-eds for the biggest newspapers, who are on tv, and have massive social media following. People who are known outside the liberal circles. Guys who, in a nutshell, my grandmother would know. Well, we have plenty of those. Every time there’s a hot economic issue, you can find a liberal in each and every tv channels. Their videos go viral in social media, the same as their memes. And we have Javier Milei, who is a Rockstar. Milei is a media sensation and has single-handedly taken the libertarian message way beyond its typical recipients. Milei is engaging a new generation of young people who want to hear more about freedom and are fed up with the old and failed recipes of the past. Why? Because liberalism is the Counter-Culture. If today you want to rebel against the established, you want to free yourself from what your professors, your parents and all the old people around you tell you, the only way you have left is to become liberal. Liberalism, which goes far beyond the economic, is the most countercultural thing you can find in Argentina today. With liberalism you are going to bother almost everyone – even Pope Francis himself. In this sense, the left is a victim of its own success. They managed to control every aspect of our culture. And that deprives it of being attractive as an alternative. It can no longer be opposition to the establishment because it is The Establishment. Thus, liberalism not only offers the best ideas but has also the strength of what’s new and challenging. There are more and more liberal kids because liberalism grows in the same social interstices in which young people feel comfortable. Prohibited books, social networks, youtube, memes, podcasts and non-traditional media. Unfortunately, from politicians, the state, the government, and the taxman, not the best news are coming out. And a lot has to do with the mistakes of the current government. Since they’ve got in office, the government announced that their policy will be a one of “Gradualism.” Changes will happen. Some reform will be implemented. But almost in homeopathic doses. Aldo Abram, a prestigious economists, has claimed that in economics instead of gradualism what we’ve had so far has been “Inmobilism.” No change at all. So-called “disability” pensions are a great example of this lack of reform zeal. Needless to say, this is an obvious fraud. However, the government has done nothing about it. The same could be said about the fight against inflation. The timid advance of 2017 in which inflation was reduced to just27 per cent has been decimated by this year’s rate – which will be in the vicinity of 40 per cent. Deficits have historically been a problem. Mauricio Macri’s government did nothing at all to solve this situation. In fact, his deficits are even worse than Cristina’s! Since the government of Cambiemos (Let’s Change) took office, the instrument they used in order to pay for gradualism and deficits was debt. And markets were extremely open-handed with Argentina for about two years. However, starting in March this year, a brutal devaluation of the peso occurred. Why? As my friend Iván Cachanosky explains, the crisis can divided in three stages. First, in mid-March of this year the international context changed. Then, the country suffered a problem in the supply of dollars. Finally, the demand for pesos began to fall sharply. In mid-March, the US dollar began to appreciate. In addition, the interest rate of the Fed began to increase and the economy had already reached full employment. When these changes occurred in the international context, they made Argentine lenders begin to look in more detail at the country’s numbers. The fiscal deficit did not fall (ended 2017 at 6% of GDP) and the current account deficit increased (reached 4.8% of GDP from 2.7% observed in 2016). In a nutshell, the lenders said “enough!” It became evident that, in fiscal terms, more than gradualism there was inaction. Faced with the change in the international context, not only the lenders stopped lending us, but also the dollars that came in due to financial speculations also began to turn around. In this case, it should also be taken into account that a financial income tax was applied to them that surely helped those capitals to leave. However, if the financial income tax had not been applied, financial capital would have remained the same due to the change in the international context. Nor helped the drought that crosses the country this year, because they are less dollars that had not existed drought, had entered. Finally, when observing the exchange rate, people were scared and the demand of pesos collapsed. What does this mean? That the pesos they have, they use to buy dollars. In other words, faced with a situation where the supply of dollars had become insufficient, now the demand for dollars (due to a fall in the demand for pesos) is increasing even more. This caused the exchange rate to accelerate its advance. This situation led to having to renegotiate with the IMF in the face of the failure of the original plan. At the base of Argentina’s problems, nonetheless, lies a two-headed beast. Namely, public spending and fiscal pressure. Public spending is extremely high. Before the 2001 crisis, it was around 25 per cent of GDP. Today it is more than 40 percent. It’s like our politicians have added an extra state to be supported by already beaten up taxpayers. Naturally, Argentina’s public sector voracity comes at the expense of the citizens’ pockets. The country not only has one of the highest fiscal pressures of the world but the highest of Latin America. It is the “world champion” in raising the fiscal burden as percentage of GDP. Namely, close to 13 points between 2002 and 2016. Incidentally, Ireland decreased its fiscal pressure by more than 4 points in the same period. People are fed up with peronism. They almost hate it. It’s a synonym of decay and everything that is wrong with the country. In spite of all his shortcomings, Mauricio Macri still has a good chance to be reelected. I would put it in 70 per cent. This happens in spite of Macri’s silly gradualism. His presidency has been a bottom up event and people don’t want peronists and populists back. But Macri’s presidency is underachieving. Is it a missed opportunity? Not yet… But there’s not a clear reform agenda nor a transformational impulse. In certain aspects, it seems that the people are ahead the political class and their demands are not being met. People want real change. Liberals are the only ones who can provide the reasonable policies Argentina desperately needs to stop the decadence and start growing. Maybe the best way to make our voice heard in an election year will be with a political candidate and a strong candidate. This is a likely scenario. 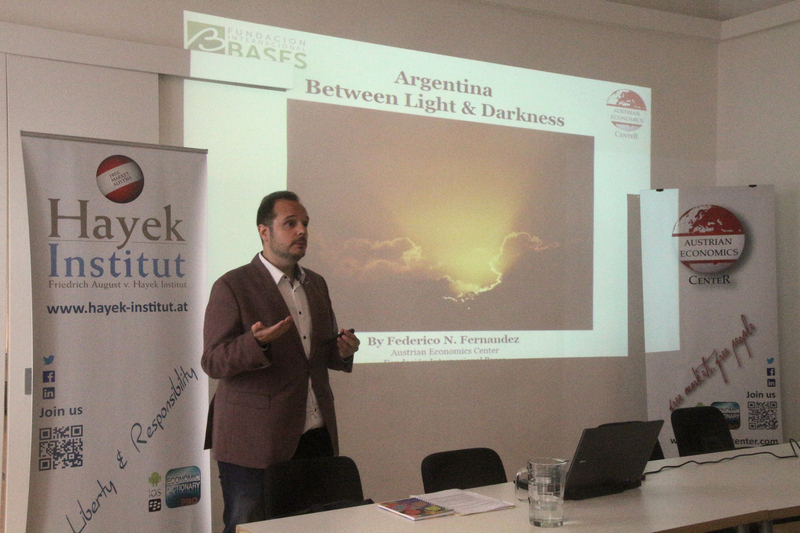 * Federico N. Fernández is President of Fundación Internacional Bases (Rosario, Argentina) and a Senior Fellow with the Austrian Economics Center (Vienna, Austria). He is also the president of the Organizing Committee of the International Conference “The Austrian School of Economics in the 21st Century,” which has taken place every two years since 2006 in Rosario (Argentina).